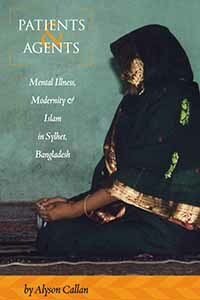 Note: Berghahn has just published Alyson Callan’s Patients and Agents: Mental Illness, Modernity and Islam in Sylhet, Bangladesh, an ethnographic study that explores how changes in the global economy have led to an increase in daughters marrying outside of their local kinship network, which in turn has increased their vulnerability to mental illness. An excerpt with images from Chapter 6 follows an introductory note from the author. Bangladesh is one of only five countries in the world where women have a shorter life expectancy than men. The low status of women in Bangladesh is underpinned by the virilocal rule of residence. As daughters leave their natal home to live with their husband’s family at the time of marriage, it is argued that nurturing them is regarded as a relative waste of resources, compared to nurturing sons who will stay and contribute to the wealth of the household. However, women’s oppression is not experienced in a uniform way. Older women achieve a higher status as mothers, and, as mother-in-laws, may oppress their sons’ wives. The concept ‘woman’ does not occupy a single analytical category and the status of women varies according to the role they occupy. In this excerpt I suggest that the ‘Ma’ icons seen in most rural households provides evidence that the mother is revered on a par with Allah. [There is] a tension evident in Bengali culture between the law of the father and the law of the mother. The popular Indian conception of the mother as self-sacrificing overlies an unconscious fantasy of the phallic, castrating mother (Nandy 1990). Bagchi (1990) suggests that Bengali culture is particularly prone to employing this threatening aspect of the mother. The powerful and murderous Kali, who dances on the corpse of her consort Shiva, is a goddess who enjoys greatest popularity amongst Bengalis (Fuller 1992). Wilce (1998a) argues that in Bangladesh mothers are feared and placed in symbolic opposition to Allah. He cites this famous passage from the Hadith: in answer to the question, ‘To whom do I owe the most respect?’ the Prophet replied, ‘Your mother.’ His answer remained the same when pressed to declare the second and third persons deserving respect. ‘Father’ was listed fourth [1998: 108]. Another quotation commonly recited in Sylhet is ‘Heaven is under the mother’s feet’, meaning that obedience to the mother is the path to heaven. Yet whilst the mother-in-law in Sylhet is feared, conscious representations of the mother portray her to be loving and all-forgiving, if not to say indulgent. This latter attribute seems to me to be diametrically opposed to Allah who takes a meticulous account of his subjects’ good and bad works, doling out punishment and rewards as appropriate on Judgement Day. That the mother is revered on a par with Allah is demonstrated by the prevalence of ‘Ma’ iconography (ma is short for amma – mother). (Muslim) lorry drivers have ‘Ma’ painted on the front of their trucks; posters are sold reproducing poems and pictures celebrating the mother. 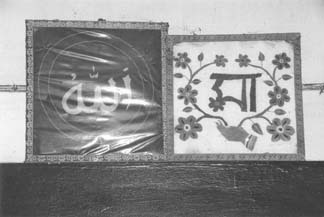 Most strikingly of all, ‘Ma’ embroidery samplers and other ‘Ma’ icons are hung up on the wall next to Islamic icons – Allah’s name in Arabic, Qur’anic verse, pictures of Mecca. I saw these ‘Ma’ icons in every rural household that had grown-up children present; it was explained that ‘we have maya (love) for Allah and amma above everything else; for amma because she has suffered greatly for us’. Figure 6.3. 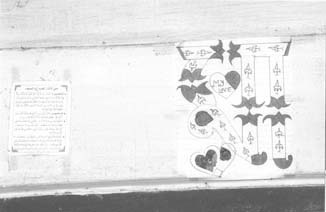 Left: Ma icon commemorating the date of death of the household’s mother; the Arabic reads: ‘Allah, we came from you and we will return to you’. Right: the mosque at Madina with lines from the Qur’an. Alyson Callan is a psychiatrist and anthropologist. She currently works as a consultant psychiatrist in Brent for the Central and North West London NHS Foundation Trust.